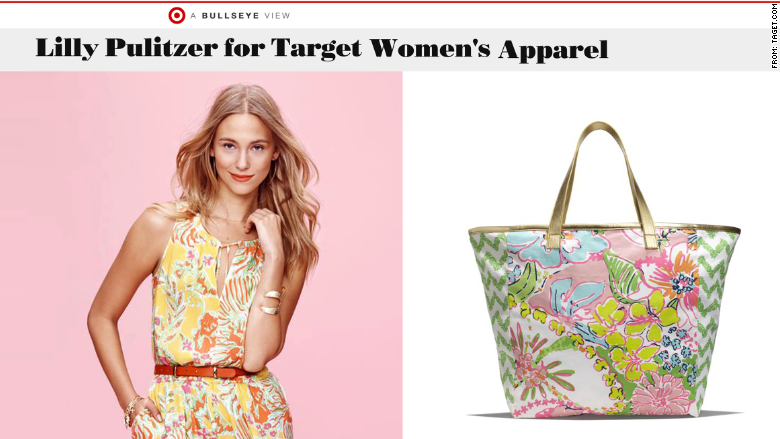 Dresses with pink giraffes and pants with pastel palm trees are coming to Target from Palm-Beach designer Lilly Pulitzer. The limited-edition line from Pulitzer, known for its colorful, summery clothing, launches on Sunday. The new 250-piece collection will be available at all Target (TGT) stores and online. Items range from bikinis and beach coverups to dresses and sandals. There will also be girls' apparel and home goods including plates, glasses, plates and beach chairs on sale. The collection is only available through May 31 (or while supplies last), so expect preppy crowds to line up at the doors to scoop up what they can. A version of Lilly's sleeveless, collarless signature dress will be on sale at Target for $38 while most Lilly Pulitzer dresses go for around $180. Target's Lilly bikinis are priced at $48 for the top and bottom, compared to $136. 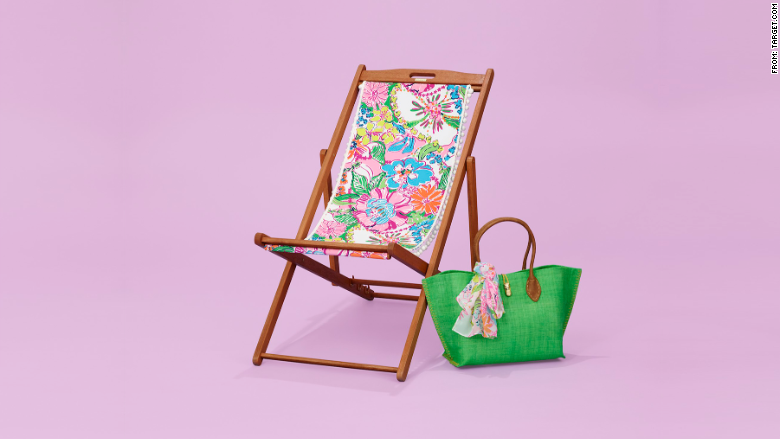 A Lilly beach chair, which isn't part of the designer's usual lineup, will be priced at $60. Lilly's bold and bright patterns are hard to miss. In fact, Lilly Pulitzer herself designed the first dress with vibrant colors so that it would cover any juice stains she got from working at a juice stand in Palm Beach, Florida. Target often teams up with high-end designers to create limited edition fashion lines. The collections, from designers such as Alexander McQueen, Prabal Gurung (a favorite of Kate Middleton), and Jason Wu (who designed one of Michelle Obama's inaugural gowns), tend to create lots of buzz and sell out within hours. In 2011, Missoni for Target created Black-Friday-like demand, and the retailer's site crashed several times. The Lilly Pulitzer line will go on sale during the "early morning hours" on Sunday, a Target spokeswoman said.